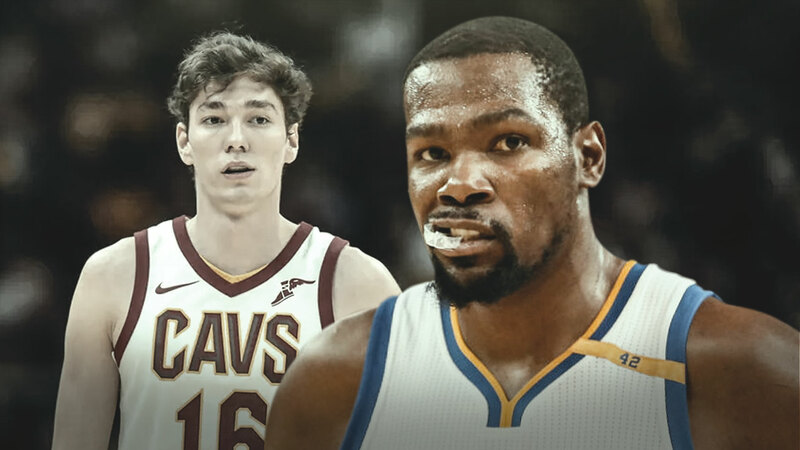 Prior to the Cleveland Cavaliers’ matchup against the Golden State Warriors on Wednesday night, a game that provided far more nostalgia for the past than entertainment in the present although the Wine and Gold held their own against the reigning MVP champions for the first half, Warriors superstar Kevin Durant had quite a few positive things to say about Cavs fan favorite Cedi Osman. Osman, a second-year forward who spent the first two seasons of his career, worked out with Durant in the offseason in a moment that was commemorated by a picture on Instagram. An athletic wing who can now play up to four positions, Osman has shown flashes of being a threat as a spot-up threat, off-the-dribble playmaker and facilitator. The most consistent parts of his game are his defense, both on and off-ball, and his finishing ability in transition but the former Anadolu Efes star still to needs to refine more parts of his game than he doesn’t. Especially if he’s to be a cornerstone player for the Cavs, as the franchise wants him to be. Per Basketball Reference, Osman has averaged 11.5 points, 5.2 rebounds, 2.4 assists and 0.8 steals per game on 37.3 percent shooting from the field, 32.1 percent from three-point range and 82.4 percent from the charity stripe, his efficiency down in every category except for free-throws because of his increased workload in the absence of Los Angeles Lakers superstar LeBron James, who pelted from The Land in the summer. However, the Cavs’ cult hero has shown that he has the mindset and all-around skills needed to be one of the better wings in the league, all the same. Perhaps Osman is more Lamar Odom than he is LeBron, that’s fine. In any case, Osman has been a sponge from the beginning and his willingness to learn earned him a workout with Durant, James and Kawhi Leonard, the top small forwards in the league. Osman is a player that the entire organization is rooting for and that type of beloved character seems to always exist in the Cavs locker room but rarely is that player so young. At 23-years-old, the best of Osman’s career has yet to be seen. Hopefully, he’ll be in a Cavs uniform the entire time.